About LeeAnn. Dr. LeeAnn Lindsey is the owner and principal consultant for Edvolve, an edtech consulting group whose mission is to prepare today’s students to thrive in an increasingly digital & connected world. She has been an educator for over 20 years and has held roles in the classroom, district office, regional/statewide training centers, higher education, and the non-profit space. From 2011-2016, LeeAnn led the infusion of technology throughout the teacher preparation program in the Mary Lou Fulton Teachers College at Arizona State University. Her leadership led to full technology infusion in every methods course within the pre-service program aligned to the ISTE standards, as well as professional development services for up to 60 faculty members per semester. While serving in the college, she also authored and implemented digital citizenship modules and a blended learning protocol for their use -- which research showed had a significant impact on teacher candidates’ intention to teach digital citizenship in their future classrooms. 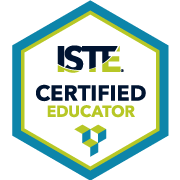 LeeAnn was part of the team that led the refresh of the 2016 ISTE Standards for Students and the 2017 ISTE Standards for Educators. She has taught educational technology courses at Arizona State University and previously held an executive team board position with the Arizona Technology in Education Association. LeeAnn is happiest when she’s working with K-12 schools and districts, as well as teacher preparation programs, to create meaningful change so that every student is equipped with the skills they need to be successful today and in the future.